Growing your business across the globe is an appealing prospect. It’s also an extremely daunting one. Fortunately, you don’t have to take your first steps into the export market – or even subsequent international moves – alone. With more than 2,000 staff and a presence in over 100 markets throughout the world, UK Trade & Investment (UKTI) supports many British businesses every day. The Government Department does so through a portfolio of services designed to cover different stages of the process. Building on success, responding to change. In a nutshell: Gateway to Global Growth offers a strategic review, planning advice and support to experienced exporters, helping you build on your success and develop new overseas markets. The details: The programme incorporates a year-long programme of strategic support tailored to your needs to help grow your company’s business internationally. The programme aims to assess changing markets and opportunities, responding with well thought-out solutions that deliver continued international growth. The strategic review with an experienced International Trade Adviser (ITA) assesses trade development needs and helps construct a next steps action plan. It includes guidance and mentoring from export professionals and support on specialist subjects. 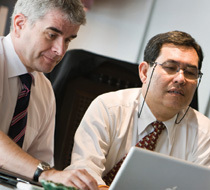 The content also includes business master classes, advice on language and culture, support on a range of specialist subjects such as protecting your intellectual property or managing foreign exchange, advice and assistance with market research, access to UKTI’s international network, connection to international trade business networks and signposting to UKTI services, other government services and private sector providers. Are you eligible? Small and medium enterprises (SMEs) with two to 10 years of export experience, or companies classed as ‘innovative’, are eligible to participate. Innovative companies are those with more than one employee engaged either wholly or partly in R&D activity and more than one employee engaged either wholly or partly in new product or service development, those that have employed someone external to the business to conduct new product or service development activity in the last year, or companies over two years old deriving at least some of their turnover from products and services introduced in the last three years. Communicate effectively with your target market. In a nutshell: An Export Communications Review (ECR) assesses the way that a company communicates with overseas customers and makes practical recommendations for improvement. It provides companies with impartial and objective advice on language and cultural issues to help them improve their competitiveness in existing and future export markets. The details: The ECR covers key communication tools including your company’s website, examining whether it directly targets international customers, search optimisation, and ease of use. It also explores awareness of local online competition, use of social and business networking in other languages, and your company’s ability to answer enquiries arising from your website in other languages. Development of a web strategy, technical aspects involved in setting up an international website, the design, structure and navigation of the site for overseas visitors, inclusion of appropriate international content, translation and localisation for your target export markets, site promotion, and managing the impact of a successful site are all things that could be covered in a review. Other topics covered by the ECR include letters and publicity materials, along with spoken communications. This covers language training needs, translation and interpreting services, and the company’s readiness to handle different languages at overseas trade shows or exhibitions. Am I eligible? Participants can benefit from a programme of reviews summarised in a written tailored report with recommendations and an action plan. The cost of each review is £500 (plus VAT), the first three of which are match-funded by UKTI with a subsidy of £250 for eligible companies. These consist of exporting companies that have been trading for at least two years and employ fewer than 250 staff. Get started: To apply for an export communications review, complete and submit the online application form at www.gov.uk/export-communications-review or contact the UKTI ECR team on (+44) 0845 034 2111, or via email at info@ukecr.co.uk. Increasing exports through online channels. In a nutshell: UKTI’s e-Exporting Programme assists UK companies of all sizes to increase their exports through online channels. The details: UKTI’s e-Exporting Programme focuses on servicing the UK consumer goods sector, identified as the fastest growing sector for online exports. This service involves UKTI working closely with the world’s major e-marketplaces in order to allow UK consumer goods companies to market themselves and e-export efficiently through these goliath channels. UKTI’s e-Exporting Programme delivers a new enhanced suite of services for UK companies with global ambitions. This includes tailored advice specifically aimed at online opportunities for export-ready businesses. These added services augment the current opportunities for UK companies within the UKTI suite, such as the Export Communications Review. Benefits of joining UKTI’s e-Exporting Programme include: meeting with an e-Exporting adviser to discuss export plans; receiving help and advice on building your online and e-commerce presence; increasing the reach of your brand globally; identifying new e-marketplaces around the world; setting up on e-marketplaces quickly; and attending events and webinars about retail/e-commerce opportunities. If you’re looking to sell online for the first time, you can also get help with: trademark registration; website URL registration; landed cost calculation; packaging, shipping, payment; tax registration; and marketing and related services. Get support for your research efforts. In a nutshell: The Export Marketing Research Scheme (EMRS) offers support, advice and some grant funding to eligible companies wishing to research a potential export market. It is designed to encourage exporters to carry out marketing research when considering entry into new overseas markets. The details: Export marketing research is the systematic and objective collection of information about an overseas market. It can help companies reach sound decisions on such issues as whether or not to export to a new market, how best to deliver products/services in the market and whether to and how best to invest in the country. By using marketing research, a company is less likely to make costly mistakes at the market entry stage. The EMRS aims to increase UK exporters’ confidence and competence in the conduct and use of marketing research, to ensure UK companies undertake or commission marketing research based on sound methods, and to achieve a widespread understanding of the discipline and benefits of marketing research in the exporting process. The EMRS programme covers research on key topics, including market size and segmentation, regulations and legislation, customer needs, usage and attitudes, distribution channels, trends, competitor activity, strategy and performance. There are three main categories of marketing research supported by UKTI. These are in-house overseas marketing research (where a staff member has the ability and experience to carry out the project to a satisfactory standard), marketing research projects conducted by professional market research agencies, and the purchase of published marketing reports. Professional advisers can offer free advice on how to set about conducting export marketing research including the conduct of both desk and field research, advice on locating and briefing suitable market research agencies and on evaluating proposals and reports, and sourcing appropriate market research if it is already available in a published report. Am I eligible? Companies with between five and 250 employees with a proven track record of at least two years trading are eligible for grant support. UKTI can fund up to 50% of the agreed costs of marketing research projects. Get started: If you would like more information about this service you can access advice in the guidance notes, downloadable from www.gov.uk/export-marketing-research-scheme. You can also contact the team on info@ukemrs.com or arrange a meeting with a Research Adviser through the International Trade Adviser service. Prepare yourself to face new challenges. In a nutshell: Doing business internationally can entail certain risks, including political and economic developments, cyber risks, bribery and corruption. For this reason, UKTI and the Foreign & Commonwealth Office (FCO) can provide you with key information to help you manage these potential issues. The details: UKTI and the FCO have brought together authoritative, accessible and topical information on countries, and the key issues related to the political, economic and business security environments. This helps companies understand and effectively guard against risks when they export. FCO diplomats also regularly provide authoritative, clear assessments of political and economic factors in key emerging markets. The reports are varied and topical and aimed at helping UK businesses to identify and pursue new opportunities and manage risk. Get started: The information collected by UKTI and the FCO can be accessed via the UKTI website at gov.uk/ukti.